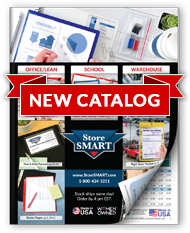 Organize, track, and categorize critical paperwork with StoreSMART's Paperwork Organizers with Card Pockets. Each organizer is sealed on two sides, and includes a convenient thumb notch to make retrieving your paperwork easy. The impressive capacity (one hundred 8 ½" x 11" sheets) means you'll be able to find a home for every scrap of paper in your office or manufacturing facility, while the bright colors will help you and your employees sort, route, and store them. The crystal clear 8-gauge fronts allow you to discern the contents at a glance—but just in case there's any confusion? Each folder includes an adhesive ID pocket! Stick it wherever you like, slip a business card or label inside, and never lose track of your important documents again. Front is crafted of 8-gauge crystal clear vinyl; back is crafted of 12-14-gauge solid vinyl. Sealed on two sides, with a thumb notch on the long side. Overall size: 9" x 11 5/8". Inside capacity: One hundred 8 ½" x 11" sheets. Each folder includes a clear adhesive card holder. Customize your card holder location quickly and easily. Card holder is open on the long side with a ¼" lip. Holds up to 5 business cards. Interior capacity: 2 1/16" x 3 7/16". Medical facilities: Use the pockets to highlight key patient information in order to deliver the safest, most effective care. Businesses: Color-code your paperwork in order to funnel it toward different departments. Our file jackets will also protect your important work from spills and damage as it travels throughout your facility. Teachers: Use them to collect student work for portfolio assessments, or to organize student worksheets throughout the day. Homeowners: Keep track of maintenance records, renovation purchasing orders, bills, and other household paperwork.